"Ben really made the best use from our little garden, giving us an area to eat, relax, and enough space for the kids to play. Would highly recommend their design and landscaping services"
Having moved into this property a few years ago, the homeowners had just about finished renovating the inside of their home. Their back garden was next, which comprised a cracked and half sunken 1970’s crazy paving with a weed covered lawn, interspersed with low level walls holding back a planting scheme that had no real theme. It was in need of some serious work. The homeowners wanted to zone out their garden, and have a purpose for each area leaving no dead space. Firstly, a lawn was essential, as should be in any good garden. The existing lawn puddled regularly due to the heavy clay, plus it was more weeds than grass. We could have turfed the lot, but that wouldn't have solved the puddling problem. Instead we opted for spraying off all the existing vegetation and turning over all the soil to about 30cm depth, whilst mixing in a large amount of washed sand, about 400kg’s. We used fast growing lawn seeds and overseeded the lot, leaving a thick, very healthy and puddle free lawn. Another key criteria was a space to eat, including a brick built BBQ appended to a patio area. They wanted this area to be located immediately outside their french doors, affording easy access to their lounge. We agreed a low feature wall would help to segregate this area off, which could be continuous as it blends with the brick build BBQ. The patio area for the BBQ faces south west, catching the evening sun, and looks great as well as being the perfect size for a small party. A neglected part of the garden, with three walls on either side, was selected as being suitable for a pergola, where alpine olive trees and grapevine will grow to provide the homeowners with the occasional treat. This area suits a perfect location for their childrens sand pit, and can house a bench or long table. 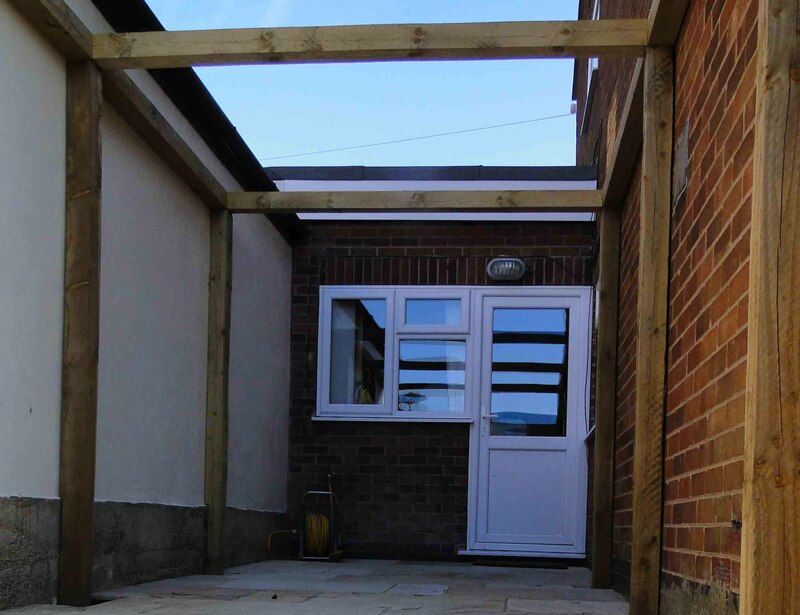 The pergola height was set to restrict the view from a neighbouring window and maximise privacy. Finally, they wanted an area to grow some vegetables in a raised planter. We went for an oak sleeper planter for added aesthetic value and a good enough size to allow a good variety of veg to grow. The height was kept low so the young children could get involved, which could easily be made higher in later years. 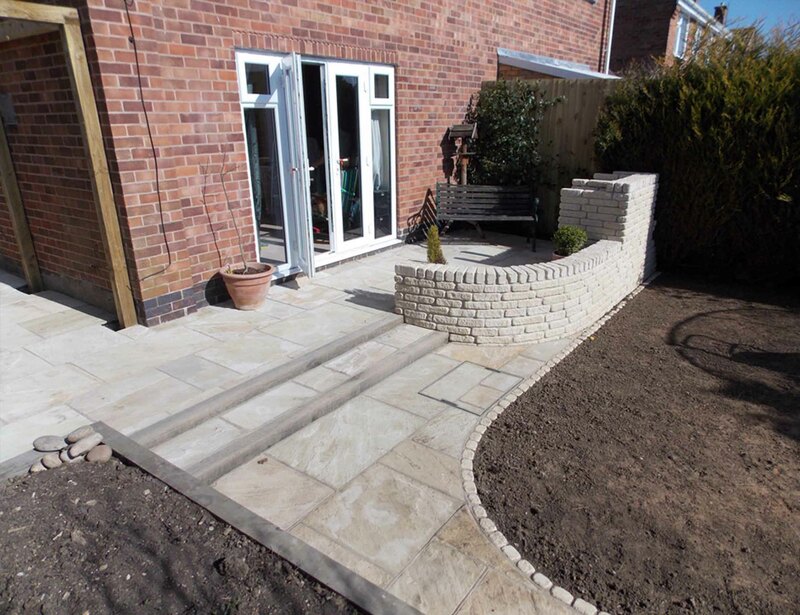 The end result, a cracking garden that suits all the needs of the homeowners, where no space will be left untouched and has flexibility should their needs differ in the future. 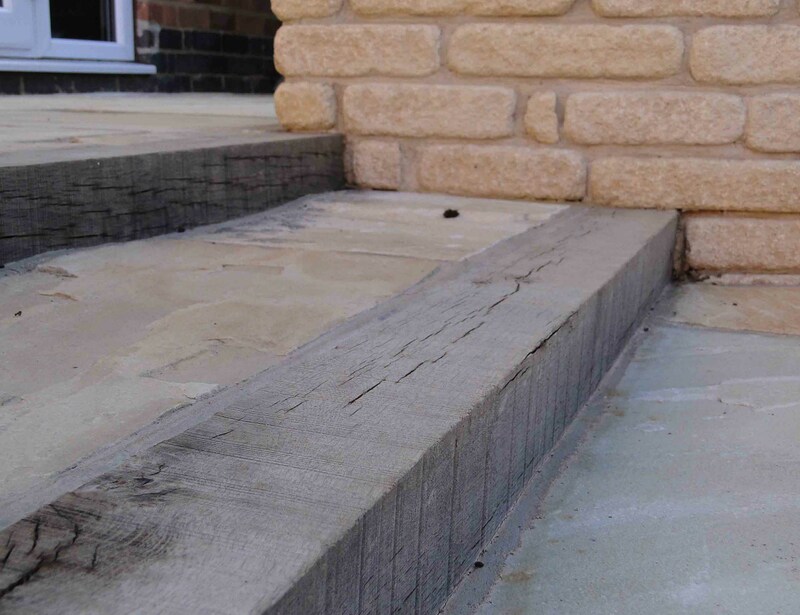 Click here to read more about the oak sleeper steps, including tips on installation and design. 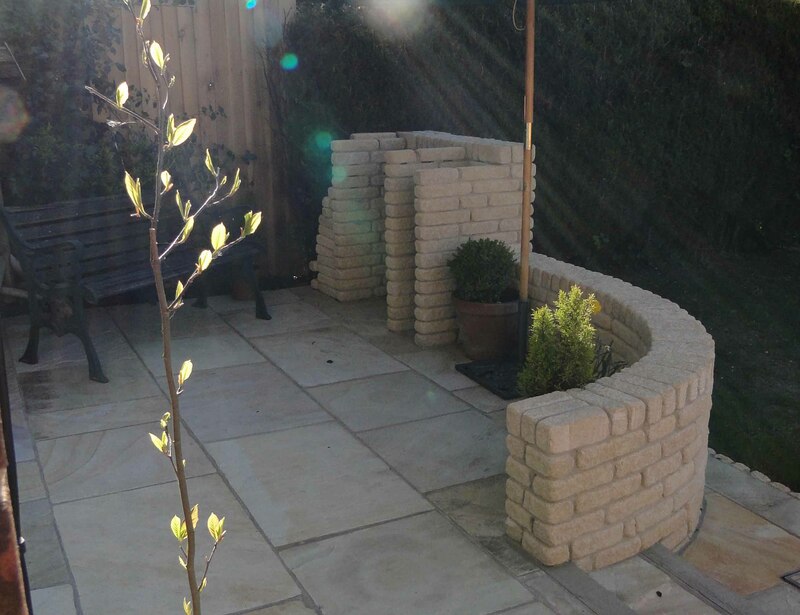 Posted in gardens, patio, portfolio and tagged bbq, contemporary, eating, garden, patio, paving, pergola, planter, relaxation, sandstone, seating, sleepers, steps, stone, wall.